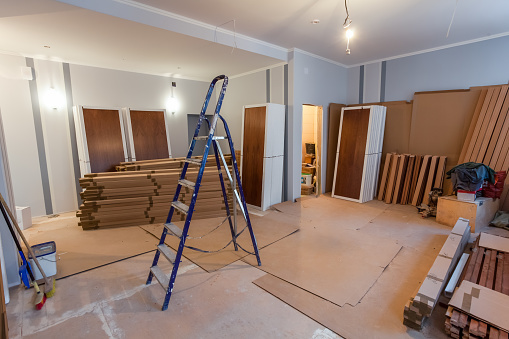 We were recently contacted by a young couple looking for a basement remodeler in Woodbury able to take on a large project to convert some under-utilized space in their home. The couple wanted to renovate their currently-unfinished basement and turn it into an apartment they could rent out for some extra cash. We felt our company would be perfect for this basement remodeling job, so we sent someone out to do a consultation right away. The couple was looking for two key elements in their remodel: a stylish, modern kitchen with hardwood floors and a bathroom with a relaxing, spa-like feel. Beyond that, they were open to any ideas we had. With our lengthy experience as both a kitchen remodeler and a bathroom remodeler, we felt our company was up to the challenge of completing their key requests, as well as the rest of the project. We provided the couple with a detailed plan for how we would renovate the space and actualize their vision for the apartment, should they hire us as their home remodeling contractor. The plan discussed the specifics for each aspect of the work and stated the estimated cost and timeline for the project. Once the couple reviewed the plan, they agreed to hire us and we got started. We began by ensuring the basement was properly insulated, plumbed and wired, so everything behind-the-scenes was working correctly before we put up the drywall and installed the flooring. For the floors, we decided to go with hardwood floors in a medium walnut throughout the entire space, to provide a cohesive flow. For the walls, we chose paint in light, neutral colors to make each room appear brighter and larger. In the kitchen, we installed dark cherry cabinets to contrast with the lighter floors and stainless steel appliances to provide a cool, sleek look. The countertops we chose were granite with flecks of brown, black and grey, and the backsplash was a dark grey tile installed in a diamond pattern. We decided to put in a center island to provide more cabinet and counter space. The bathroom was the last aspect of the project. The couple selected a tan adobe stone for the floors and a smaller, blue and green tile for the shower. The countertops and cabinets matched the kitchen, using the same flecked granite and cherry wood. When all the work was complete, we made sure to instruct the couple on how to maintain each aspect of the remodel to ensure their basement had a long and prosperous life. The couple was thrilled with the results and couldn’t wait to find tenants for their updated space. They promised to contact us with any future projects in their home.